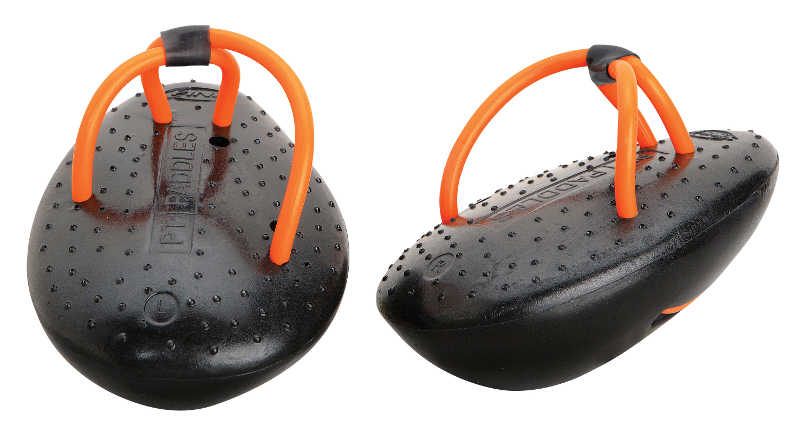 It's about the journey...: Aquagear.com gear review-Jennie takes on the Finis PT Paddles! Aquagear.com gear review-Jennie takes on the Finis PT Paddles! Recently, I was asked by aquagear.com to check out their site in order to possibly do some reviews on their swimming gear. I was invited to chose an item to check out, so I headed over to the site to scope out what was available. 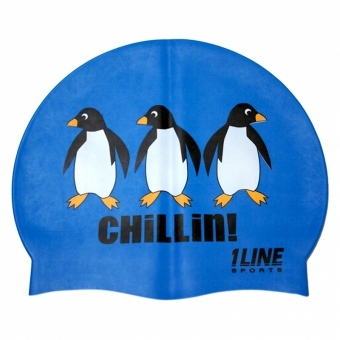 The website was easy to navigate and well-organized, and although I was distracted by some of the more fun items (brightly patterned swim caps and my favorite swim toy ever, fins, for example), I instantly knew what I should look for-Finis PT paddles. Conveniently, aquagear carried them. Yikes again. At least the water in our pool is really clear. Again, at one point when I was swimming with Mary, she broke out the dreaded PT paddles, and I again struggled with them. I’ve determined that I really have no body awareness in the water. I know what I’m supposed to be doing, but I can’t figure out how to do it-and the more I think about it, the harder it gets. My arms (especially my right, it seems) still can’t figure out how to move into that high elbow catch position. The body rotation is especially troublesome-I do rotate a bit to my breathing side (right-but not at the expense of flailing my legs everywhere), but not at all to my non-breathing side (left). Both these flaws probably also contribute to my nasty right hook whenever I swim in open water, so I became curious to see if the PT paddles could teach me to do automatically what I can’t do consciously-sort of akin to when in the PT clinic I finally physically guide a patient’s limb through the motion I’m trying to get him or her to do with verbal or visual commands. I decided that it was fate to finally cave and try them out for real. I selected the PT paddles from aquagear.com, and they showed up on my doorstep shortly afterwards. Luckily, they came at a good time-my time off. If one thing could make me sort of enthusiastic towards getting back into the water, it would be a new toy (even if it meant making swimming take even more time). I got back into the pool after my time off, and with no structured workout to do yet, I was free to play around with the paddles. The paddles were easy to adjust, and with them secured to my hands, I was off. This time around, it didn’t feel like as much of a drown-fest as it had a year ago, but it was still HARD to move forward. I concentrated on the feel of what I was doing-I could feel my left elbow popping up towards the surface of the water. I then turned off the brain, and swam another couple of laps, trying to let my body figure out how to get from one end of the pool to the other most efficiently. I then tuned back into what was happening, and…was that my right arm, trying to develop a little bit of a catch? Maybe, just a little bit. After a few laps, I took the paddles off and swam normally. The first little plus that I noticed was that suddenly my hands felt like huge paddles, sort of akin to going from swimming normally to swimming with my beloved giant paddles. Although I was still swimming at my normal remedial pace, I at least felt like I was cruising-never a bad thing! I alternated a few more laps with/without the paddles, and tried to concentrate on what I felt my arms doing with the paddles on so that I could translate it into a better stroke once I took the paddles off. I was able to notice some subtle difference as I went along, as well as some shortcomings. My right arm was trying to reach out a little farther and my elbow was trying to stay a bit higher, but the muscle pulling I felt indicated that I have some flexibility issues to deal with! 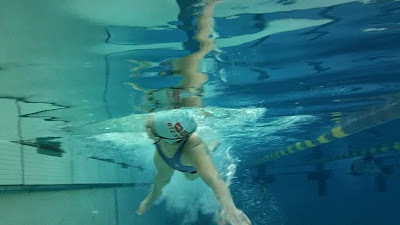 Towards the end of the swim, I felt confident enough in my PT paddling ability to take away my kick while using them. Before that point, I still hadn’t really become aware of any body rotation developing. Once I had the pull buoy between my legs, though, I almost immediately could feel myself rolling side to side as I swam along. This was a revelation to me-one of those so, THIS is what it’s supposed to be like! moments. I was disproportionately excited. I locked in the feeling for a few more laps, and then tried pulling without the paddles. The body rotation stayed. With the buoy out, though, it started to become more of an unnatural struggle again. Still, I was able to periodically “remind” myself by putting the paddles back on for a few laps. Overall, my initial reaction to the PT paddles was encouraging. I can see why Mary had been pushing them on me, as they do seem to help address some of the form issues I have that simply thinking about hasn’t been able to solve. Do I suddenly have perfect freestyle form? Of course not-not even close. The paddles aren’t a cure-all, but after swimming with them on and off for the past week, I can see how they’re going to assist me. Like any other pool “toy”, they’re not necessarily a cure-all, but another very useful tool that, with proper application and use, will help me (hopefully) inch those swim times down bit by bit. I could see them being used effectively between hard sets in long workouts in order to remind myself of some good form points as I become more fatigued, or during recovery days. Recently, my coaches and I discussed using the recovery days in the pool to concentrate more on form/drill work rather than just straight swimming-the PT paddles will likely fit in perfectly there. Overall, early on they seem like they’re helping to help me move my swim form from “conscious incompetence” (I know what I’m doing wrong, but can’t correct it) towards “conscious competence” (I can do what I’m supposed to be doing, but I have to think about it). With time and further PT paddle use, I’m encouraged that this can become more automatic. At the very least, I’ll continue to feel like superwoman when I take them off and swim with actual use of my hands! I’d recommend giving them a try (this says a lot, coming from someone that rarely speaks good of anything pool-related). Thanks again to aquagear.com for letting me try them out, check out their website for all sorts of other neat toys (and sweet swim caps)! My seasonal favorite aquagear cap offering. 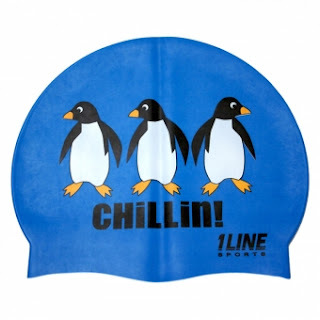 Penguins would also make me like the pool more! Bookmarked!!! I love what I’ve learn from what this article had shared!! !Two thumbs up!!! No questions ask! I’m getting one of these “Evil little suckers” LOL!